Each puzzle consists of a blank grid, divided into various regions, with one clue to the left of every row and at the top of every column. 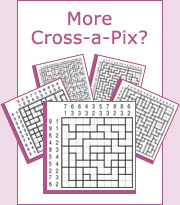 The object is to reveal a hidden picture by painting squares so that in each row and column the total number of painted squares matches the value of the respective clue. In addition, all squares in a region must be the same - either all empty or all painted. Each puzzle consists of a blank grid, divided into various regions, with two clues to the left of every row and at the top of every column. The object is to reveal a hidden picture by painting squares so that in each row and column the total number of painted squares matches the value of the first clue, and the number of blocks (continuous painted squares) matches the value of the second clue. There must be at least one empty square between adjacent blocks. In addition, all squares in a region must be the same - either all empty or all painted. Each puzzle consists of a blank grid, divided into various regions, with one clue (in the case of SingleClue puzzles) or two clues (in the case of DualClue puzzles) to the left of every row and at the top of every column. The object is to reveal a hidden picture by painting squares according to the rules above.